In the UK, 10 million people are now aged 65 or older. That’s 16% of the population! Furthermore, we’ve seen a significant population growth among those 85 years and older. Advancements in medicine and education have played a huge role. This is great news because our loved ones can be with us longer to see their family grow and succeed. Unfortunately, these added years aren’t always healthy ones. Proper nutrition and staying active is key to leading a life that is both long and healthy. It’s recommended that older adults do at least 150 minutes of moderate-intensity aerobic exercise throughout the week. Because two minutes of moderate-intensity exercise is generally comparable to one minute of vigorous exercise, they could instead do 75 minutes of vigorous physical activity, or an equivalent combination. Older adults who are physically unable to perform at the recommended level should still be as active as their bodies allow. A doctor or experienced fitness instructor could be a valuable asset in determining the safest and most beneficial level of activity for each individual. Through BalletBeFit, we offer classes specifically tailored to older adults, helping more and more people to feel younger longer. The low impact class provides older adults with the security of a barre to hold throughout the class. The support of the instructor and others in the class can also do wonders for motivation, communication and raising spirits. In fact, a recent survey found that participating in a 12-week low-impact dance program decreased the amount of pain medication taken by 39% in a group where the average age was 80-years-old. That’s incredible! It also improved balance and general movement among participants, which is vital for remaining independent. 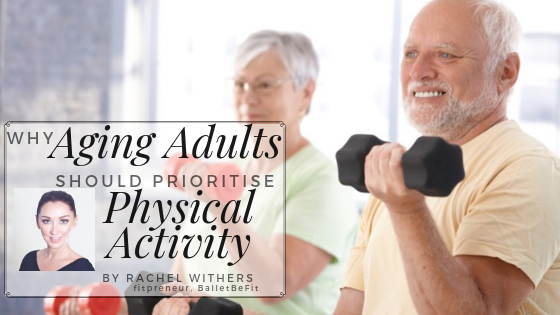 Beyond classes, there are ways aging adults can stay active daily. Walking and daily house chores are two common examples. Anything that keeps a person moving and raises the heart rate a bit is doing the body good. When first beginning a workout regimen, it’s recommended that older adults start slowly. This minimizes the risk of injury by allowing the body to grow stronger and become accustomed to newer and more vigorous routines. It’s especially important for those who take medications for blood clots, heart problems, etc. Another vital piece of the puzzle is nutrition. Fueling your body and staying hydrated is important at any age, but especially so for older adults. Everyone has to start somewhere. Even if you or someone you know hasn’t exercised in decades, it’s never too late to begin again and focus on becoming a healthier version of your spectacular self. Morning or Evening: What Time of Day Should You Workout? Should the Common Cold Postpone Your Workouts?